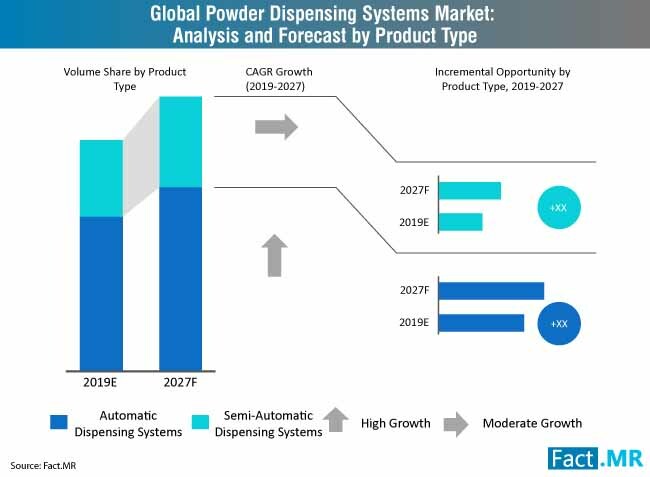 The powder dispensing systems market registered a steady growth at CAGR 4.8% during the 2013-2018 period. 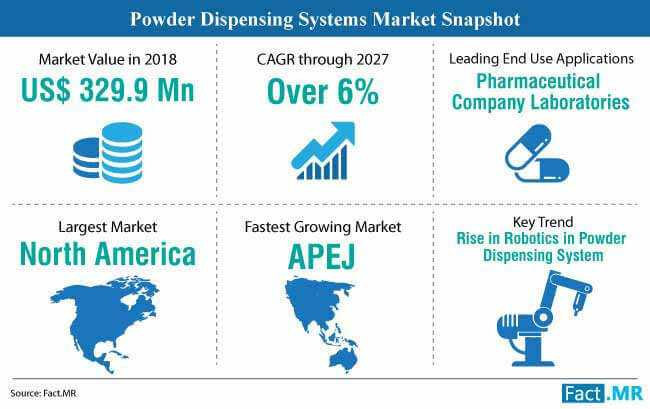 Intensifying clinical trials and burgeoning demand for novel treatments is expected to bolster powder dispensing systems market growth which was valued at almost US$ 330 million in 2018 and is poised to register a Y-o-Y growth of 5.9% in 2019. 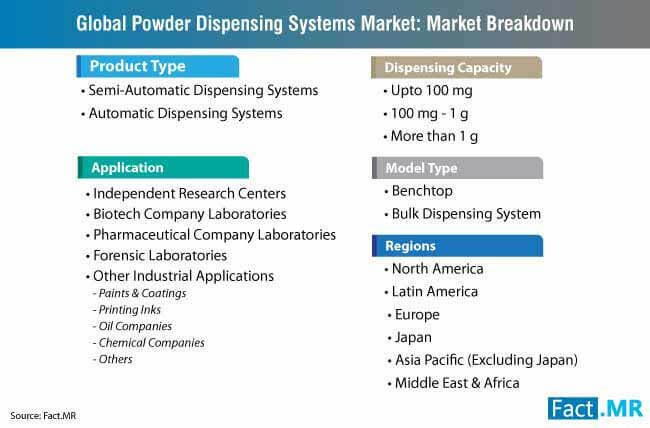 North America is estimated to account for the bulk of the powder dispensing systems market share with the presence of numerous pharmaceutical powerhouses and sophisticated infrastructure in the region. 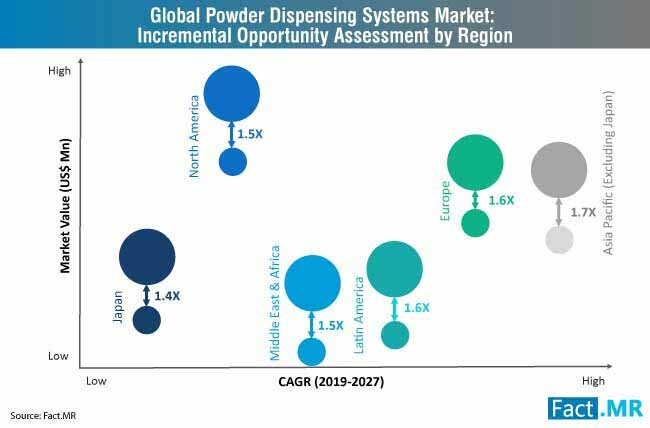 APEJ is expected to emerge as the fastest growing region for powder dispensing systems market owing to the maturing healthcare systems in the region coupled with intensifying government initiatives to promote manufacturing in the area. Note: For more key insights into the powder dispensing systems market, request a sample. What are the Factors Driving the Growth of Powder Dispensing Systems Market? Powder dispensing systems are gradually gaining traction in pharmaceutical manufacturing with the development of automated systems enabling companies to boost throughput and reduce time to market. 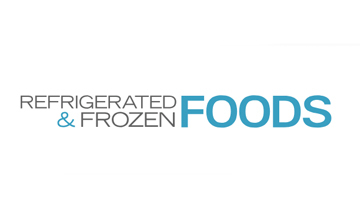 Additionally, evolving technology is aiding the development of efficient dispensing systems with enhanced accuracy and precision. Demand for these systems is estimated to surge as personalized medication and treatment gradually begin to go mainstream. This factor is estimated to be vital to powder dispensing systems market growth. Increasing patent expirations and intensifying competition in the pharmaceuticals market is fuelling clinical trials for production of novel drugs and formulations. Systems with sophisticated precision and accuracy dispensing capabilities are estimated to find an increasing usage for the production of capsules and vials for clinical trials which is expected to contribute significantly to the powder dispensing systems market growth. Growing collaborative efforts among different pharmaceutical and biotechnology giants for the development of sophisticated technology and infrastructure to substantially reduce the time for R&D of novel treatments is estimated to propel powder dispensing systems market growth. The main focus of these collaborations is to develop a powder dispensing system which could handle an assortment of powder types and enable dispensing of precise dosages. Powder dispensing systems market growth is estimated to be upheld by its increasing demand in the field of additive manufacturing. Intensifying researches towards the use of powdered metal forms for additive manufacturing is a vital factor which is likely to fuel demand for powder dispensing systems in an array of industries. Burgeoning consumer demand for creative surroundings at home and offices is estimated to benefit powder dispensing systems with the equipment finding increasing usage in the coloring of concrete, brick, and mortar. 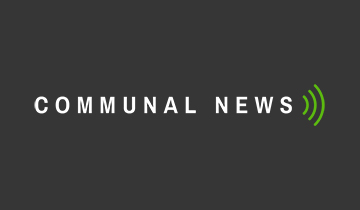 Bolstering construction around the world coupled with the growing demand for the addition of a visual appeal to both corporate and residential spaces is expected to fuel powder dispensing systems market growth. Note: For detailed information on variegated factors driving the powder dispensing systems market growth, request a sample. What are the Key Challenges Stifling Powder Dispensing Systems Market Growth? While powder dispensing systems are enabling automation in the pharmaceutical industry, harnessing their capabilities on a large scale is increasingly becoming a problem for pharmaceutical manufacturers. The challenges can be attributed to the lack of an efficient system for powder management which could potentially result in the contamination of the end products. Additionally, the challenge is further being compounded by the requirement to fill the powdered material into an assortment of different destinations such as vials, capsules etc. The complex management of different powdered substances with varying properties and characteristics also poses a daunting challenge to the powder dispensing systems market. 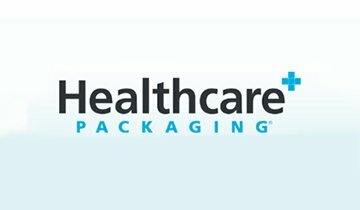 Imposition of stringent regulations on pharmaceutical production standards pose a daunting challenge for powder dispensing systems market with companies seeking accurate, precise and cost-effective systems to replace traditional powder dispensing equipment. A development complementing the pervasive trend of collaborations between companies towards the development of sophisticated infrastructure and technology to substantially reduce the lead time to new treatments was when the Enabling Technologies Consortium, a group of biotech and pharmaceutical companies, released a study outlining the need for development of powder dispensing systems which could handle an assortment of substances while dispensing precise dosages for clinical trial drug development. 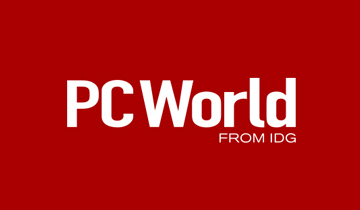 To capitalize on the burgeoning demand for precision powder dispensing, GiroNEX, a leading player operating in the powder dispensing systems market launched its own proprietary technology which according to the company is capable of dispensing 0.1 mg to 5 grams of chemicals into capsules and vials with an accuracy of 2% or better. 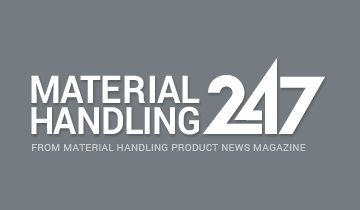 Powder metallurgy is increasingly becoming popular in additive manufacturing and a recent development complementing the pervasive trend was Stratys’ announcement highlighting the use of powdered dispensing systems in its proprietary Layered Powder Metallurgy. The company aims to simplify the 3D printing of metal components by leveraging the technology. Powder dispensing systems are estimated to continue gaining penetration into additive manufacturing in the foreseeable future. A recent development complementing the pervasive trend was when Aerosint and Aconity3D announced entering an alliance for the development of Laser Powder Bed Fusion for 3D metal printing. The system will use Aerosint’s powder dispensing system which can be used for multiple different types of materials. Other companies operating in the powder dispensing systems market include Mettler Toledo, 3P Innovation Ltd., Novaflow, FTA Inc., Matrix Containment Technologies, PCT Americas, Coperion GmbH, Sopac Medical S.A., ETB Van Meurs B.V, APoDiS technologies, Ferry Industries Inc., Anmol Scientific, Autodose S.A., and BioDot Inc.
With drug development on the rise, pharmaceutical and biotechnology companies are investing heavily in equipment and infrastructure to gain a competitive edge in the market. Additionally, the increasing frequency of patent expirations is propelling clinical trials which require formulation and screening of precise medications. The factor is estimated to drive the surge in the demand for automated powder dispensing systems in pharmaceuticals and biotechnology applications. Powder dispensing systems with capacities ranging from 100 mg to 1 gram are likely to remain in demand owing to the range of applications the systems can be used in. The demand for dispensing systems with capacities of less than 100 mg, more than 100 grams, and 1 gram to 100 grams are also expected to rise as the systems are likely to find increasing use in additive manufacturing. Forensic laboratories and independent research centers are also expected to account for a significant share of the powder dispensing systems market. Bulk powder dispensing systems are gaining traction over benchtop powder dispensing systems as pharmaceutical companies look to bolster production. The report on powder dispensing systems is a consequence of a robust and elaborate research methodology. A two-step research process involving primary and secondary researches was conducted to obtaining in-depth and actionable insights into the powder dispensing systems market. Primary research was conducted by interviewing experts from the powder dispensing systems market while thoroughly studying paid sources, trade journals, company press releases, and other publications related to the powder dispensing systems market formed the basis of the secondary research. Results from both the steps of research were cross-referenced with each other to produce an accurate and authentic forecast of the powder dispensing systems market. 13.8. ETB Van Meurs B.V.